Ever experienced innovation fatigue? The way your office is designed might be the cause. This article considers how a fresh new office design can improve innovation and productivity and looks at reports on how bad office designs can actually result in poor employee output . We’re not talking about being too far from the printer or water cooler – after all, an excuse to stretch your legs and have a chat with your work colleagues is never a bad thing. We’re talking about the cheapest-part-of-the-catalogue, half-the-ceiling-tiles-missing, built-in-the-70s kind of office. Nothing stifles your motivation to work more than a shoddy, stained carpet and lingering damp smell, and in fact, a study by Management Today found that at least one third of staff said that they were too ashamed of their offices to bring back colleagues or clients! 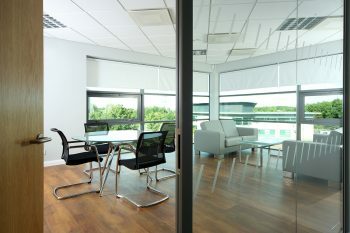 There are many elements that make up a well-designed office, from the air quality through to the floor insulation all having an effect on the overall environment in any place of work. Want to make your office a place of innovation and production? Here are some top tips to help you turn your environment from dull to dazzling. According to The New Yorker, in the US, more than 70% of office environments are now open plan – the UK is certainly not far behind. 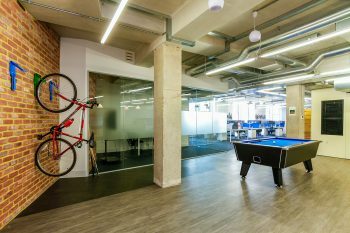 In fact, a lot of the theory behind open offices doesn’t really work – less work gets done, more distractions come into play and it’s far more difficult to get on with individual work when required. Open offices are fantastic for a creative, collaborative environment but it shouldn’t be the only option within a workspace. 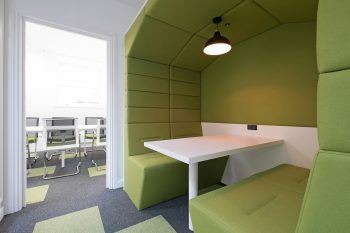 Business News Daily suggests including spaces for relaxation, privacy and open collaboration in order to match office workers’ requirements and boost their innovations. It might be shallow, but looks are important – even in an office. A Trendhunter study found that an average employee spends 72% of working hours actually at their desk – with nearly 50% of workers stating that they would be willing to stay an extra hour at work each day if their workplace environment was more attractive. That’s not a small number, and if you’re happy to be somewhere, you’re more likely to be motivated, productive and more switched-on, leading to a more innovative environment. There are many ways the majority of offices can be improved, but attractive commercial flooring, stylish wall graphics, modern furniture and good lighting are just a few ways to improve the beauty of any workplace quickly and easily. Emlii has a great list of innovative, inspiring office designs from companies who take beauty seriously, and are well worth a look at. A study by the Department for Business Innovation & Skills found that in an office environment, employee well-being has a significant impact on the quality of work produced. Well-being takes many forms, but a badly designed office can play a large role in causing lower quality work, from a lack of ergonomic furniture to an uninspiring workplace area. A detailed report by CABE looks at ‘The impact of office design on business performance.’ – we highly recommend you look at the case studies in this report to find out more.